Yeo Valley, the organic dairy brand, has opened a range of quirky event spaces for up to 120 people in Somerset's Mendip Hills. 'Amazing Spaces' at Yeo Valley's newly renovated headquarters has six rooms with capacities ranging from two to 120 people, including the Beatles, the Fisherman’s Friend, the Old Trout and the Cow rooms, as well as an old school lecture theatre. Team building events include bush tucker trials, wild food foraging, softball tournaments and BBQs by the Blagdon Lake. 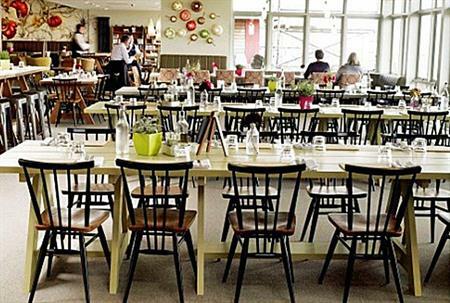 The Organic Garden Tea Room is a light open space with seating for up to 50 people. This room also has a terrace with a wood burner with views of the surrounding hills. Wills Barn provides an intimate space away from it all for a variety of activities for up to 30 people and is fully carbon-neutral as it is powered by solar panels and heated by a biomass boiler. The venue is equipped with the latest technology and offers free car parking. The Mendip Hills are 30 minutes from Bristol and Bath and 15 minutes from Bristol Airport. A bespoke menu uses locally sourced and, where possible, organic ingredients. Zoe Larder, sales and marketing manager at Yeo Valley’s Amazing Spaces, said: "Amazing Spaces offers a fun and versatile meeting and event experience away from the hubbub and traffic yet so close to Bath and Bristol. Along with our event packages, we offer something very different to other venues, providing inspiring experiences for everyone."